Catherine Zeta-jones by Shaun Higson - 8" x 10"
Catherine Zeta-jones poster by Shaun Higson. Our posters are produced on acid-free papers using archival inks to guarantee that they last a lifetime without fading or loss of color. All posters include a 1" white border around the image to allow for future framing and matting, if desired. There are no comments for Catherine Zeta-jones. Click here to post the first comment. London in England in the United Kingdom. 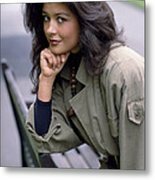 Many years ago I photographed a little known Welsh actress from Swansea called Catherine Zeta Jones. I remember at the time thinking how stunningly beautiful she was. Anyway the rest as they say is history - she went on to have great success in her acting profession and met and married Michael Douglas.If you like my work or find it interesting I would appreciate it very much if you would follow me here on Fine Art America.